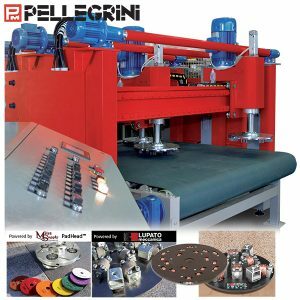 *NEW* Pellegrini’s “LA ROSSA” is a unique surfacing machine producing a wide range of finishes – at high speed! Four bridges can work independently to integrate a variety of treatments for new textures – never before obtainable. Reduces set-up time and increases production. See LaRossa video below or on YouTube. Treatments, which can be mixed, on marble are: comma, chamfering, roto bushammering, sandblasting, brushing, antiquing, polishing, and grinding. Treatments on granite are: roto bush-hammering, sandblasting, antiquing, polishing, and grinding. See blog on this. LA ROSSA has a working height of 25cm and is controlled by a pneumatic piston which is able to change the load applied according to requirements for finishing. Electrically controlled translation and rotation of each head by inverter and PLC permits total freedom to manage parameters. La Rossa Texturizing/Honing machine can be customized with flaming or bush-hammering devices. 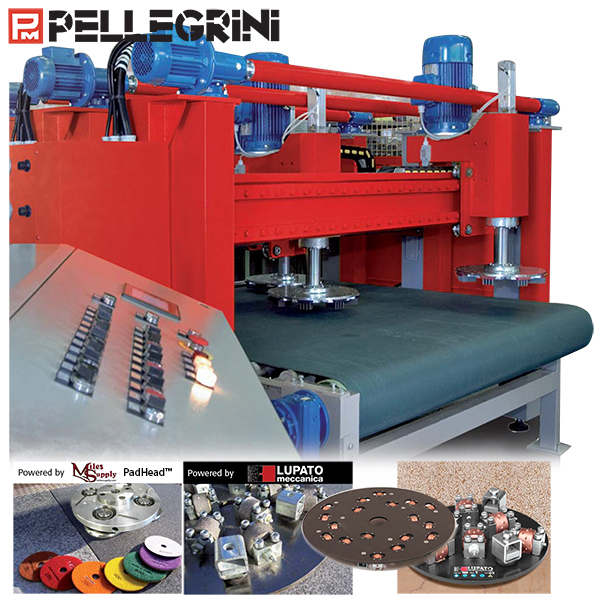 4 rotating heads on 4 independent bridges – can use frankfurt bricks & brushes, PadHead™ grinding plates, and Lupato plates.